Today, I juggled gratis work with my deadlines. This is the poster art for my daugher's high school play. 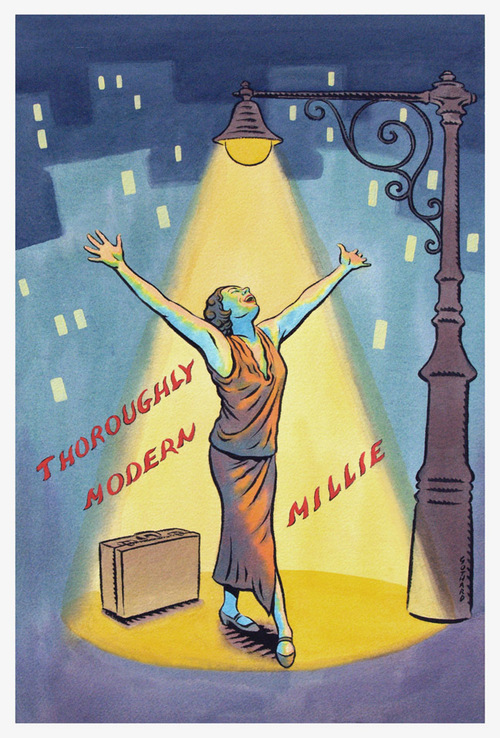 She is the lead (millie) in "Thoroughly Modern Millie". They requested something simple and eye catching, so I used the single figure and a bright palette. There will be a great deal of text added to the top and bottom, so it will undoubtedly get busy. i forgot how difficult it is to control watercolor on such large (15 X 22), saturated paper. Beautiful beautiful job for a beautiful actress. Break a leg Anna. Ha! I just closed a production of TMMillie. I played Miss. Flannery. Take a look at my picture on the Who's Here page. Fun show. Your daughter will have a blast! A beautiful poster, indeed. Love the light blue shadows, and palette in general. The closeup of the figure is so great to see, with all the character of the line and texture so accessible. I wish we could always have closeups and pullbacks of all our work, when it was printed! This is a very celebratory offering Dave. I drool over your line work and I love the close up of the color on Anna/Millie's face. That iconic pose with the arms outstreched is tough to get right. You want the extension but if the proportions are off just a little it is apparent. Good luck with all the juggling! Great poster. I can't imagine how motivating it is to do a poster of a play your daughter has the lead in and is featured on. Very cool. Nice piece, David! Love both the W/C and that lyrical line of yours.... Good luck, Anna! Love the line work and her top/skirt combo. Great stuff. 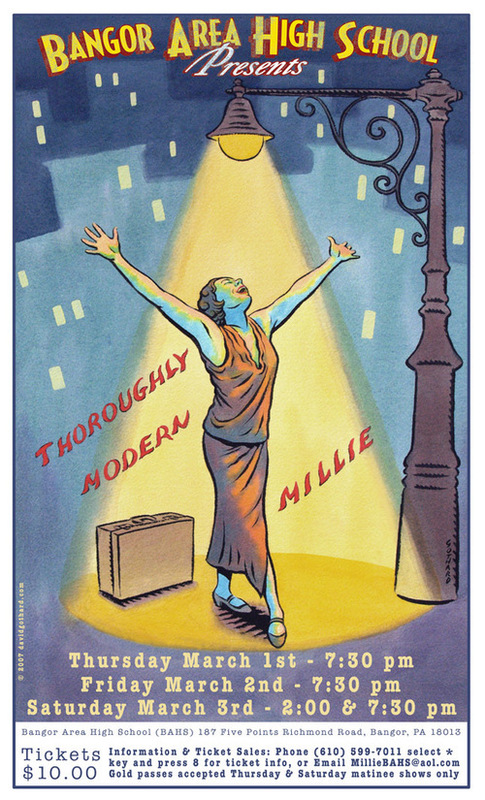 That is so cool that you get to do the poster for the very play that she has the lead role in. Wow! Beautiful Poster!!! You can really feel her throwing up her hands with joy! Thanks for adding the photo ref too!!! Great job. What a Dad! Anna should be proud of you and you should be proud of Anna. I know you are. What lucky kids! What a lucky school! Break a leg Anna! DG that is one BeaUtifullllll poster. Really fine, Dave! 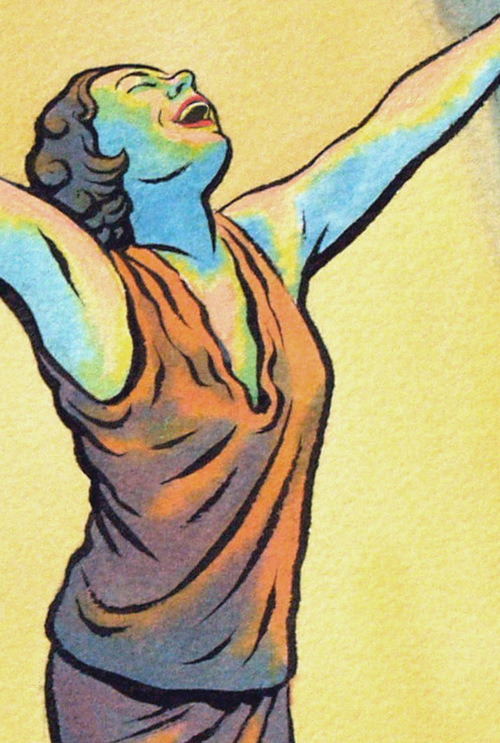 And for all you drawgers who haven't seen some of Dave's other "gratis" art for Anna's plays - his stage curtain painting (art on a grand scale) or the set for Guys and Dolls are absolute knockouts. If Dylan's basketball courts or soccer fields needed art, we probably wouldn't ever see Dave's work in print. He wouldn't have time. That's the kind of father he is...lucky kids.